The most convenient things are not always the best things. This is the case when it comes to quality trees for planting. The differences between bare root and potted trees are numerous and very significant on several levels. With a potted tree, we have the convenience of buying any time of year and delaying planting for months. Bare root trees are grown in the ground, never in any kind of container. They can only be safely transplanted when they are dormant and the ground isn’t frozen. Here in upstate NY, that is a short window that generally only happens during the months of November and April. The rest of the time, the trees can’t be moved without risking heavy losses. So, what’s so great about bare root trees that I would be willing to sacrifice this convenience? Soil: Because bare root trees are grown in the ground, they require zero potting soil. There is no perlite, peat moss, shredded bark, or any other bulk materials being trucked around. The soil used to grow bare root trees stays in one place forever, it never needs to be hauled anywhere. It can be built on and improved year after year. After only a few growing seasons, I am very proud of my nursery beds which are teeming with earthworms, mycelium, and a healthy network of living microorganisms. I grow my bare root trees in deep beds of loose, living, friable soils that are extremely high in organic matter. The soil is so deep in my beds that I can often pull out whole roots of dandelions and sometimes even burdock without a tool. At my nursery, a layer of mulch, usually in the form of wood chips, covers the beds. This protects the soils from the compacting effects of rain, and from the volatilizing effects of the atmosphere. As rains and melting snows seep into these nursery beds, the water is slowly absorbed through the capillaries of the soil. Compare this to a potted tree, which leaches out rainwater, carrying with it nitrates and phosphates from fertilizers that can enter waterways. I should mention that not all bare root nurseries have the best soil practices, many of the larger ones in particular use herbicides and mechanical cultivation on their fumigated, synthetically fertilized soils. So, if it is important to you, check in with individual growers. There are several nurseries besides mine, doing great things with their trees and soils. Roots: A living network of microorganisms, earthworms, and mycelium interact with the tree. In this environment, roots form fibrous, spreading systems. They do not circle around each other as in a pot, but rather form natural, healthy, and quite beautiful shapes. A circling root system can often lead to permanent damage, as tree roots will wrap around their own trunk, eventually girdling the tree. The roots of field grown trees always comes in the shape determined by the tree rather than the container. Quality grown bare root trees are feeding on a living soil that does not suffer extremes in temperature fluctuation. Their roots will become extremely fibrous with many hairs, and their rates of growth can often be double that of potted trees grown right next to them. Water: As pots will have holes in the bottom to let water out, they need to be watered frequently. They are usually above ground and black. The temperature in containers fluctuates constantly. A small black pot can dry out in a matter of hours. Compare this to mulched soil which can take weeks if not months. Almost every day that it doesn’t rain during the summer, I water my potted plants. It is a very different story in the bare root beds. Because of the high organic matter content and a layer of mulch, I never water them. The soils in the bare root beds can be kept so healthy that there is no need for any irrigation whatsoever. This is a tremendous savings in energy, time, and materials. Also, these beds can absorb water rather than leaching out water and nutrients. One added bonus to the water aspect of bare root trees is that they are planted while dormant. The tree suffers very little, if any transplant shock. The soil is moist during the dormant season, and a thick layer of wood chips will keep that moisture all year during a typical northeast summer. So, bare root trees rarely even need to be watered after planting. Space: Bare root trees can be grown on very tight spacings. I grow 4 foot apple trees only about 5-6 inches apart within the row. I grow mulberry seedlings by the hundreds in a 3 foot by 20 foot strip. In a 40’ by 50’ space, I can fit well over a thousand trees. My goal within the next couple years is to grow 10,000 trees in my half acre nursery. There is no way this is possible with potted plants. By their very nature, they take up more space, especially the popular round pots that facilitate circling root systems. Typically potted plants sit on top of plastic weed fabric, herbicide-cleared gravel, or pavement. How much of this space could be devoted to something more beautiful if we grew our trees in nursery beds instead of nursery pots? Price: If the health of the tree and the soil wasn’t enough to make bare root the best choice, the cost is also much less. When we buy potted trees, we are paying for someone to purchase or make potting soil, to move around a pot and over winter it, and to water that pot incessantly. We are paying more money for a disfigured root system that may never recover. Because bare root trees are so much easier to grow, and so much less resource intensive, they are a lot cheaper. Container trees are typically 2-3 times more money than a similar tree grown in the ground. An expensive grafted 5-6 foot tall bare root tree will rarely exceed $30-40. Potted trees cost at least that much, usually more, as any gardener knows. Timing: This is where bare root really suffers, or excels, depending on your perspective. Bare root plants look like a stick with roots during a grey time of year. Potted trees can be full of leaves and flowers during the most exciting times of spring and summer for gardeners. Bare root are only available during April and November here in N.Y. By the time May rolls around, trees are beginning to leaf out and it is not as safe to transplant them without soil attached to their roots. When we do transplant bare root trees, it must be done carefully so that the roots can never dry out. They will come packed in a moist material like sawdust or newspaper and should be planted or heeled in immediately. Trees can be heeled in until they begin to break dormancy. To heel them in, simply dig a shallow hole in which tolay the trees in a bundle and cover their roots with soil or mulch. A shady spot is ideal. Planting trees within the timing of when they are dormant is not as convenient, but it is better for the trees. They experience very little transplant shock, and when spring arrives in full force, they hit the ground running. A hundred years ago no one sold trees in pots, but people still exchanged and transplanted lots of fruit, nut, and ornamental trees. They even shipped these plants around the world. This was all done during the right time of the year for the trees, while they were sleeping. I encourage gardeners to return to a simpler method of obtaining trees, one that does not require plastic pots and potting soils being trucked around, and one that leaves our soils and waterways healthy. In no way do I mean to berate the growers of container trees. My intent in writing this is to illuminate the profound benefits of quality bare root trees. 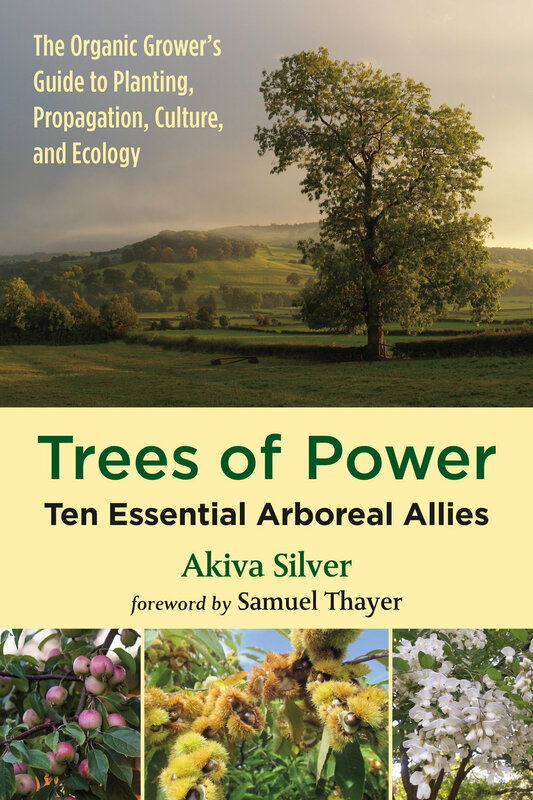 If you liked this article, please check out my book Trees of Power.